The child will be the first for the 27-year-old Olympic champ and husband Andy Hill. Image: The child will be the first for the 27-year-old athlete and her husband Andy Hill, who wed last year. OLYMPIC HEPTATHLON CHAMPION Jessica Ennis-Hill announced today she is pregnant and will miss the Commonwealth Games. “I am sorry I won’t be in Glasgow for the Commonwealth Games, but know it will be an amazing occasion. I will be at home awaiting the arrival of a little Ennis-Hill,” she said. The child will be the first for the 27-year-old athlete and her husband Andy Hill, who wed last year. 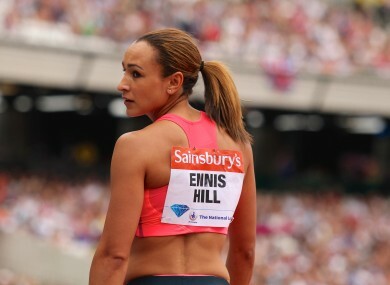 Ennis-Hill, one of the poster girls of the 2012 London Olympic Games, said she hoped to return to training after the birth and compete at the Rio Games in 2016. “We are completely overwhelmed, with excitement and a degree of anxiety that I am sure all first-time parents will relate to,” she said in a statement. “My plans for 2014 have been completely turned upside down, but having had a couple of weeks to think about things from a career point of view I am 100 percent set on returning to full-time athletics once our baby is born and go for a second gold medal at the Rio Olympics in 2016 — that challenge really excites me. Email “Pregnant Ennis-Hill to miss Commonwealth Games”. Feedback on “Pregnant Ennis-Hill to miss Commonwealth Games”.